Do Immigrant Neighborhoods Hold the Secret to Ride-Sharing? When researchers look at the reasons behind the downward trend in driving rates in the U.S., they look at several demographics: young people who prefer urban living and are getting into biking, or baby boomers who have picked a more vibrant place to spend their retirement. Immigrants form another cohort that trends away from single-occupancy vehicle travel. They tend to live in cities, they tend to use transit — and they carpool far more than U.S.-born Americans. Researchers Michael Smart, who got his doctorate at UCLA and is now teaching urban planning at Rutgers, and Evelyn Blumenberg, head of UCLA’s urban planning department, were interested in looking more deeply at the factors behind immigrant carpooling. And their findings give some clues about what could increase carpooling rates for other communities, too. Fewer than 10 percent of Americans carpool — and that number would be even lower if it weren’t for immigrants, who carpool at a rate two-thirds higher than native-born Americans. Smart and Blumenberg looked at the impact of different neighborhoods types on carpooling rates in southern California, where immigrants carpool to work at twice the rate of the native-born. With foreign-born residents making up 13 percent of the U.S. population — and 27 percent of California’s population — it’s clear these are trends worth paying attention to. There are some simple explanations. Immigrants with low incomes might not be able to afford a car, and undocumented immigrants often can’t get a license. But what matters more is living among people from your own part of the world, who literally speak your language. Smart and Blumenberg found that immigrants living in heavily immigrant neighborhoods in southern California have higher rates of carpooling — and immigrants living in non-immigrant neighborhoods carpool even less than native-born Americans. They conjecture that the social cohesion of these ethnic enclaves creates the trust and the conditions for shared travel. Immigrants tend to shop at immigrant-owned establishments, and they often get jobs through their social networks, so traveling together to these destinations becomes easy. Immigrants also use transit at higher rates than native-born Americans — but they carpool at 12 times the rate at which they use transit. Immigrants tend to settle in U.S. cities where they’ll find communities of people from their own home country. Smart and Blumenberg say this segregates and isolates them from U.S.-born residents, but it can also strengthen community ties within the immigrant community — ties that then serve as the basis for formal or informal transportation sharing. The research finds that all immigrant groups in southern California carpool more than native-born Americans, with Mexicans carpooling most of all. Does place-based (as opposed to online) social networking and community-building within neighborhoods hold the key to carpooling? Or is it unique to ethnic communities? “It’s about trust,” Smart said. “It’s about knowing people in your neighborhood.” Similar studies in African-American neighborhoods and gay and lesbian communities find similar results — people who know each other share resources, including rides. It’s harder to find data on how friendly neighbors are outside of examining blunt demographic data (though Smart liked my idea of trying to correlate carpooling with block parties). And online applications like Zimride, Lyft, and Sidecar help link up riders with drivers without the help of ethnic similarities or neighborliness. Though they could switch the cause and effect — after sharing rides a few times, people could build stronger social ties. Not all immigrant neighborhoods carpool equally, though. The sweet spot is where 45 to 60 percent of a neighborhood is foreign-born. That’s where carpooling jumps to 21 percent. Neighborhoods with lower densities of immigrants tend to be farther from the city center, with more solo driving and just 14 percent carpooling. And communities that are comprised of more than 60 percent immigrants tend to be in the inner city, where transit is cheap and plentiful. According to Smart and Blumenberg, these high-concentration immigrant neighborhoods are an average of six miles from City Hall and have 196 bus stops per square mile. On the other hand, the 45-to-60 percent immigrant neighborhoods are more than twice as far from the city center with less than half the transit — sparse enough that carpooling becomes an increasingly attractive option, but still not so diffuse that people can’t connect for similar trips. Smart said they couldn’t be sure how much of the carpooling is regular and defined, like a daily shared commute to work, versus how much is casual: “I’m going to the market; wanna come?” They do try to separate out carpooling trips from “chauffering” trips, which actually increase the number of trips rather than decrease them. But it’s not always easy to determine what’s what. The Census data they examined give no clues, but the Southern California Association of Governments collects activity diaries, which can help determine the nature of a trip. Recent arrivals tend to depend on their family contacts for transportation, but not so much outside their household. Indeed, carpooling peaks with a little more time in the country and when people have a little bit of English — and they’ve moved out of the densest immigrant communities of the inner-city to other ethnic enclaves a bit further out. But those who have been in the U.S. a little longer, and those who earn more, tend to carpool less — but they never drop to the level of the native-born. 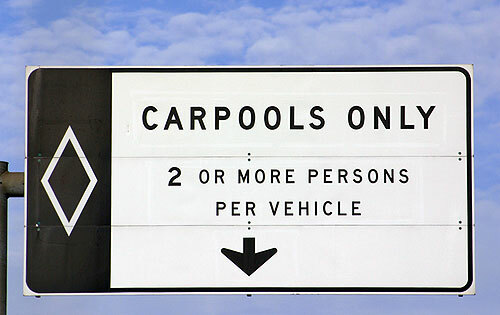 Larger households tend to carpool more, especially since a majority of carpooling is within the family. Smart and Blumenberg used data from 2000 and 2001. As urban living experiences a renaissance and cities gentrify, lower-income people — including immigrants — have been pushed out of inner cities and into farther-flung suburbs without good transit access, which could over time change the immigrant carpooling equation. Adding a question about immigration status to the Census would lead to undercounting and affect everyone who lives in urban areas, decreasing their access to federal resources. Rail~volution: Will New Americans Fuel Smart Growth or Suburbanism?